I have been so busy in the garden I have had hardly anytime to craft or cook. But I'm just about done with garden chores, so that will change soon. In fact, we are suppose to get our first snowfall next week, so the decision might be made for me! I've been blessed with such a lovely, warm fall that I was able to really get a lot more done in the fall than I have in previous years. It should make spring garden chores much easier. 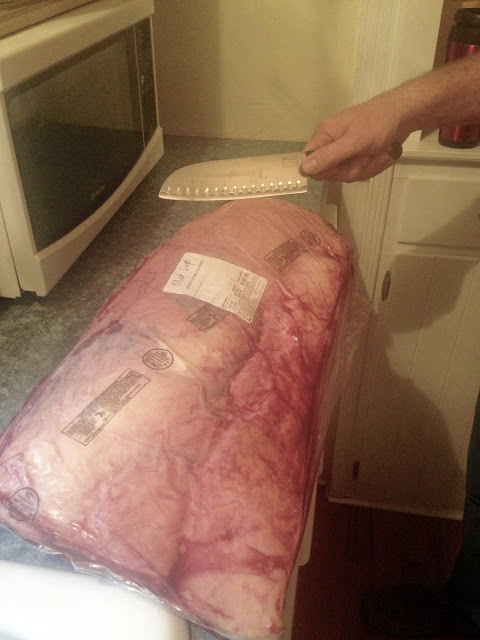 Our local grocery had these HUGE whole Ribeye boneless roasts on sale for $5.98 per pound, limit four per customer. They sold out so fast, but thankfully my husband got a rain check. However, when he went back to the store, they only had one left. Initially he was disappointed he couldn't only get three more, but considering it was $103 for one, it was probably a good thing. I couldn't even imagine paying over $400 for meat, but people did, for the price per pound was fabulous. We usually spend $8.98 minimum per pound for this type of meat. 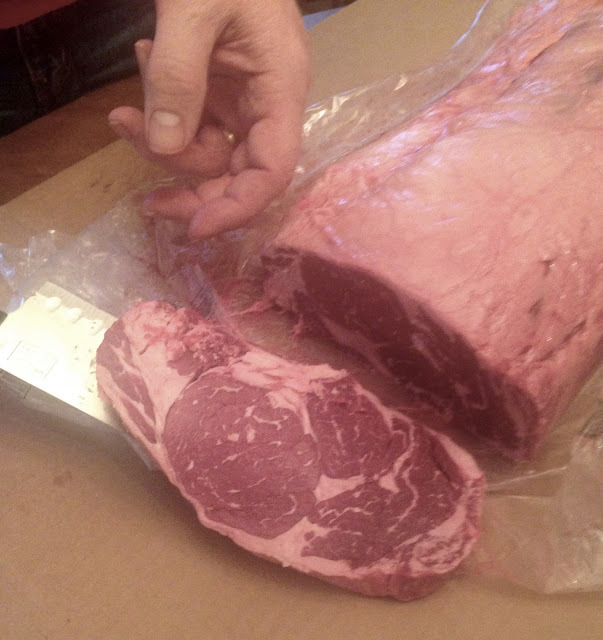 Next, it had to be cut and the butcher wouldn't do it (that's why it was so cheap!). We really don't have a lot of good cutlery, so hubby just used a large knife and went to town! His hand was really hurting when he finished! I think we got around sixteen steaks by the time he was done. I froze them in packages of two. 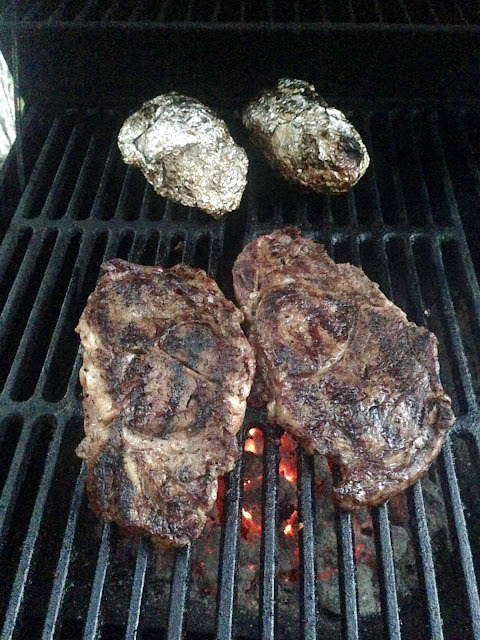 I cooked them on a charcoal grill. I simply brought them to room temperature, sprinkled some steak seasoning on each side, and grilled them for seven minutes per side. We like them medium rare. The steaks are absolutely delicious. 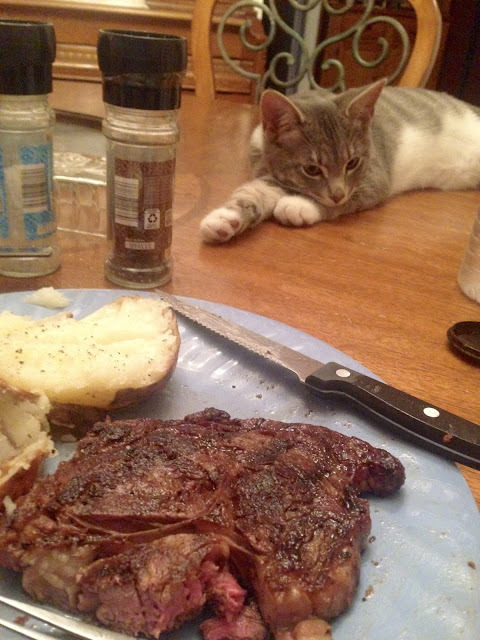 Our kitty Jackson likes to be included at meal time, so he takes his own place on the edge of the table. 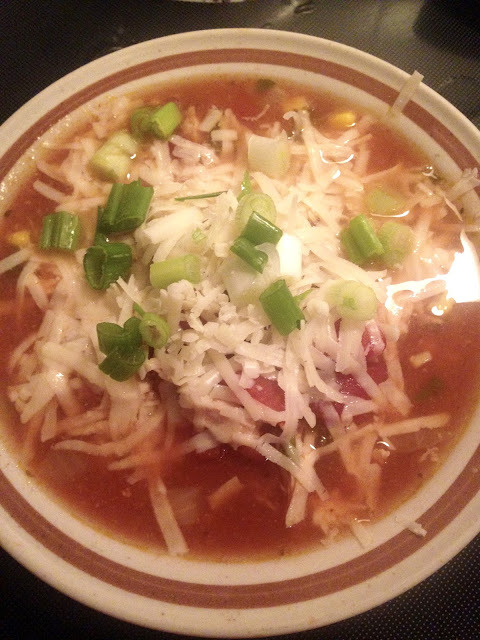 If you love Mexican dishes and soups, this is the perfect recipe for you. And guess what? It's healthy and low fat too...although you'd never know it by it's taste! It's super easy to make, and so, so good! It says to use reduced fat shredded cheese and sour cream, but we just used regular, other than that, I followed the recipe exactly. The cheese and sour cream depends on whether or not your watching your fat grams/calories. The best part of this recipe is that it's made in a crock pot. I don't know about you, but I love using my crock pot. It's so convenient to throw everything in the pot early in the morning, and have a meal ready by night. Love it. If your interested in this recipe, you can find it HERE. And finally, what do you think about green juices? They are growing more and more popular as a quick, yet nutritious breakfast. When I spent some time with my daughter recently she made a green juice smoothie every morning. She always had leftovers, and would give me a glass. It looks gross, but it was quite delicious actually. She doesn't have a recipe, she just throws in the blender whatever she has laying around her kitchen, but the main ingredient is spinach. This one had an apple, banana, spinach, and water in it, and it was yummy. I have a smoothie for breakfast quite frequently, but I usually put yogurt in mine because I need it for digestive issues. My typical smoothie contains a cup of non-fat vanilla Greek yogurt, a banana, and frozen strawberries. I have lots of smoothie recipes pinned to my recipe board on Pinterest HERE. Be sure to scroll down to find them. I have lots of recipes pinned. Everything looks delicious! And it looks like you have as much luck keeping kitty off the table as I do :-) Love green smoothies, and I really should make them more often.